← A Tent on Wheels? 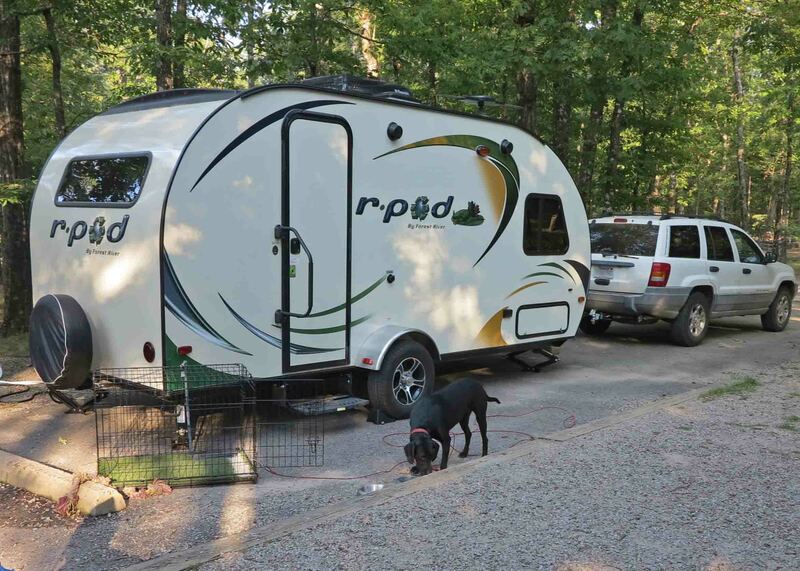 For our first R-Pod voyage, we drove the short 60-miles to Mount Magazine State Park. The Pod was a joy to pull up AR 309 to the mountaintop. Entering the visitor center, I couldn’t help but notice the trailhead I would be walking the next morning. I was looking forward to customizing a loop route linking three separate trails for my trail guide. The next morning, Hike-dog and I headed back to the visitor center for a nice hike. We started out on the Will Apple’s Road Trail with low expectations because of the “road” in the name. This old roadbed that was used in the 1800s to transport produce down the mountain turned out to be the perfect beginning for the day. It was a level trail for warming up early in the morning before tackling rougher paths. We took the spur off of Will Apple’s Road to see a small pool that would have held a strong attraction for Hiker later in the day when she was thirsty. A small concrete footing was poured a few feet away which may have held a pump at one time. Creeks were dry, but this little concrete pool held water, so a small spring or seep must be located up the rocky drainage. We quickly arrived at the Mount Magazine Horse Camp, a great place to park if you’re hiking Bear Hollow. We quickened the pace as we entered this beautiful hollow. The trail skirts the upper ridge and eventually comes to some nice overlooks. We decided to hang out at Inspiration Point for a while at sunrise. As the sun came up Bear Hollow filled with clouds. You could see them moving up the valley. Looking up the hollow to Sunrise Point from Inspiration Point. 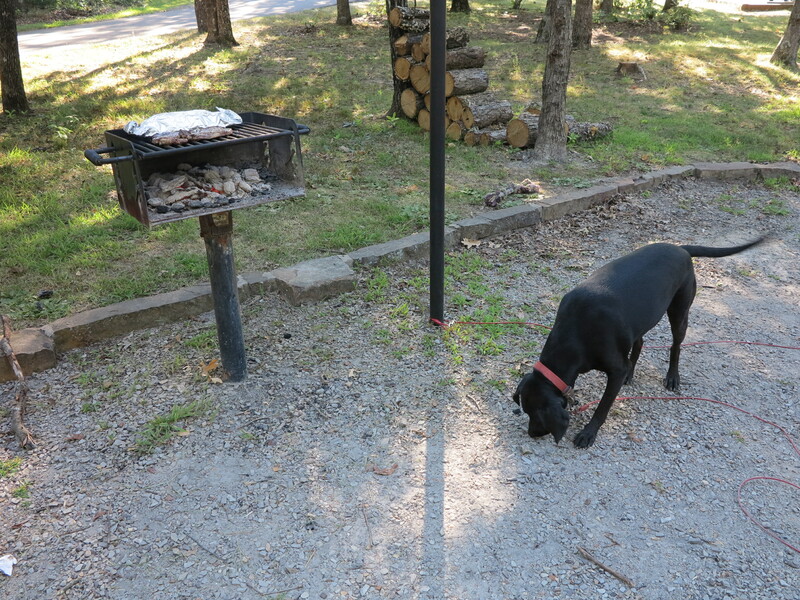 After enjoying Bear Hollow, we arrived at Benefield Picnic Area. Along the way, you pass a grave marker that reminds you of how common it was to lose a child before modern medicine. 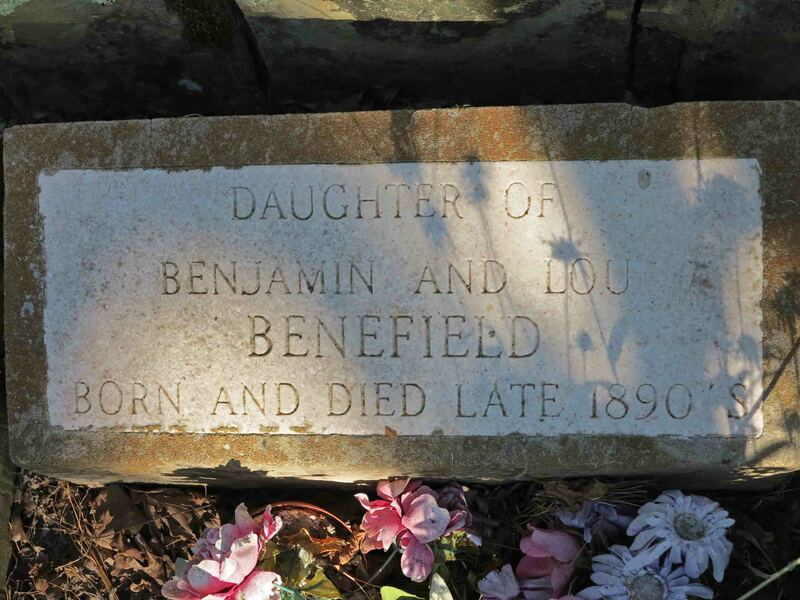 Benjamin Benefield had a large homestead on top of the mountain. 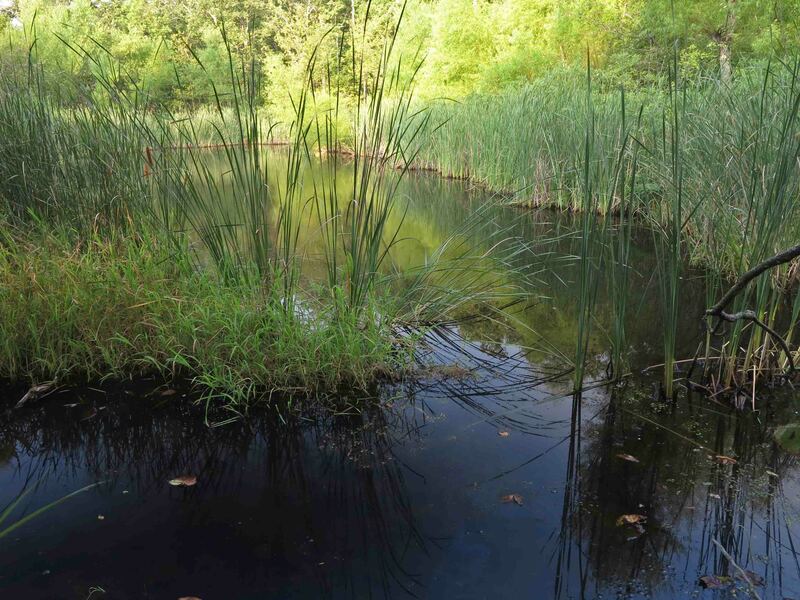 Hiker acted as if Mr. Benefield built this little pond just for her. We heard some nice frog songs around the edges. 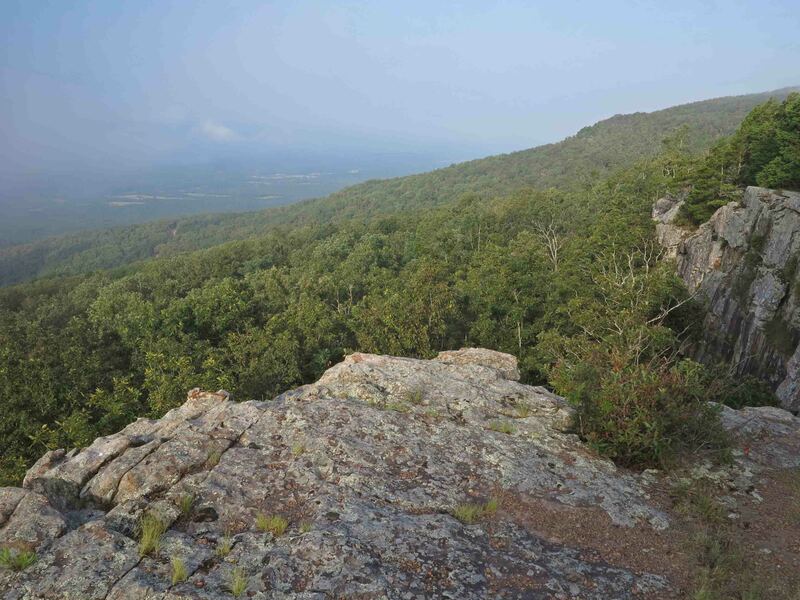 Eventually, the trail came alongside a bluff line overlooking the Petit Jean River Valley. On this morning, the valley was filled with clouds, but still beautiful. 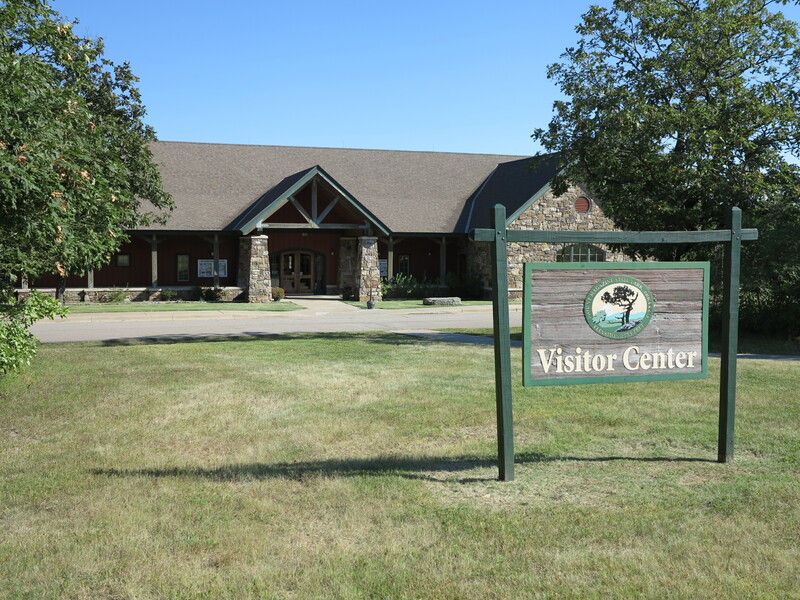 We continued around our customized loop and ended the day back at the visitor center. We were both thirsty and ready for a nap. It was a wonderful day, and I was already planning my next trip to Mount Magazine. After a nap it was time to satisfy a couple of healthy appetites and plan the following day’s hikes! 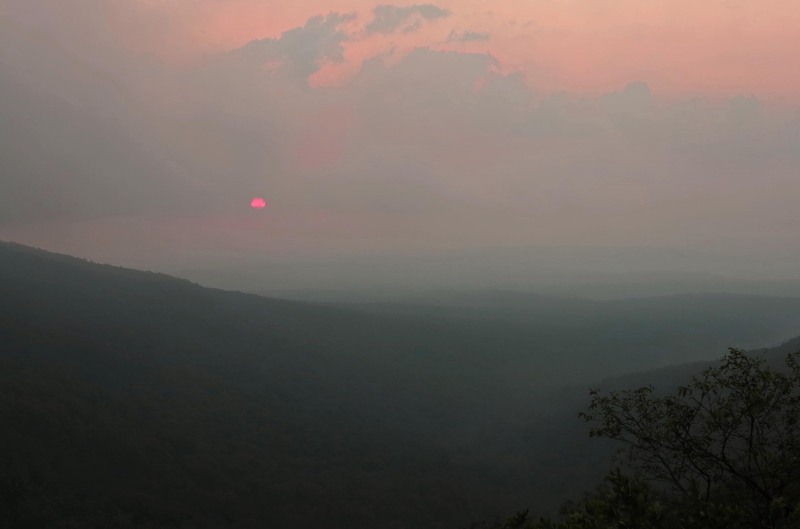 Temperatures were so mild that we didn’t use the air conditioner on our second night on the mountain. 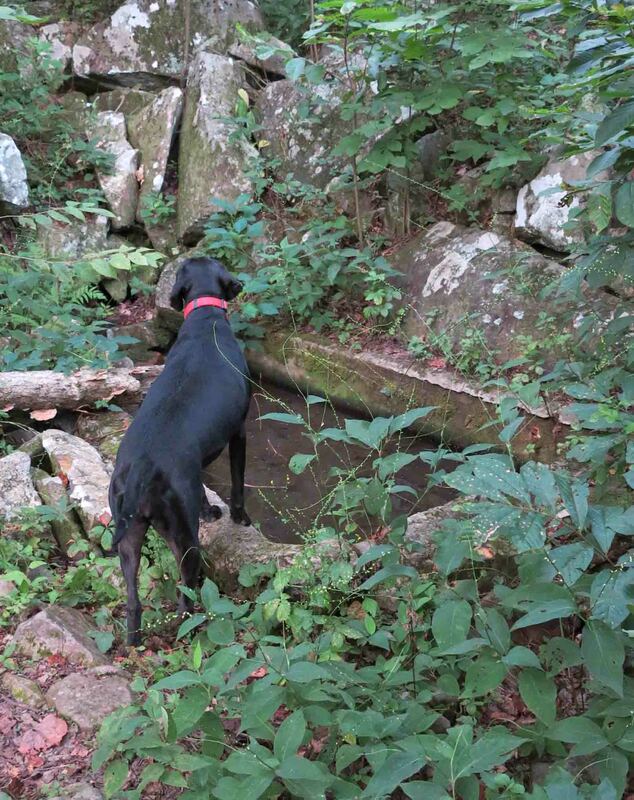 I must brag on Hiker-dog. She sleeps in a wire crate next to our trailer and doesn’t bark or disturb fellow campers through the night. We thought of the pullout as a negative while shopping, but have decided that it creates enough additional space that it is worth the extra weight. 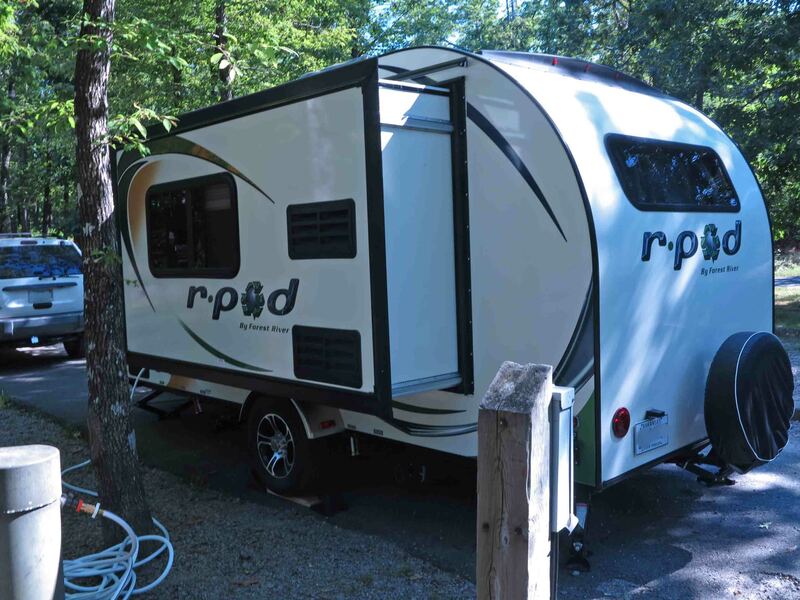 This 16-foot camper is a comfortable little tent on wheels for two. This entry was tagged Forest River R-Pod, Hiker-dog, Mount Magazine State Park, R-Pod 179. Bookmark the permalink. Beautiful shots! Thank you for sharing! A great trip….love the Pod. Loved the trail too, where to next! Will be exploring some more Missouri trails soon. Thanks for reading. Beautiful pictures of Mt. Magazine. 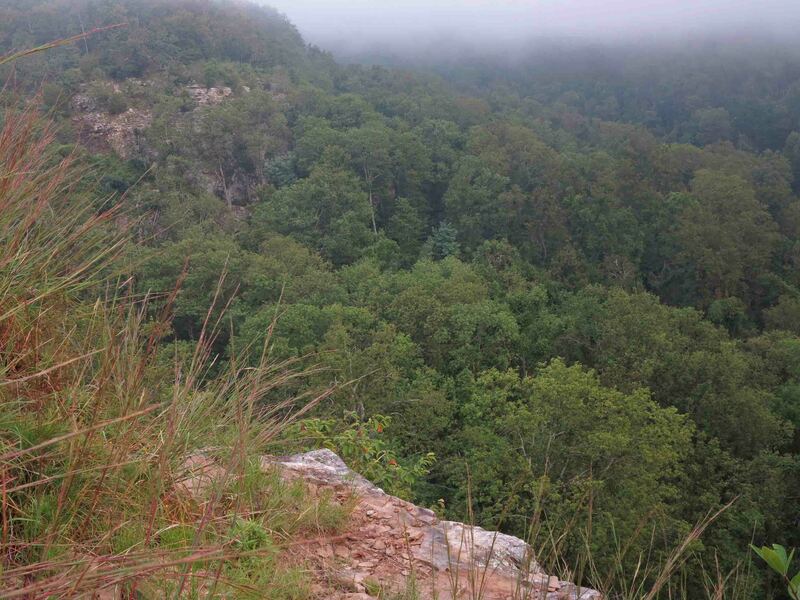 I was born and raised near there in Booneville and my grandfather and parents used to enjoy summer trips up to Mt. Magazine. Enjoyed the post. Good to see Hiker Dog is doing well. Great companion. Thanks for reading, Jack. One of my early backpacking trips was to the top of Mt. Magazine back before the state park was built. I sat on one of the bluffs to the west for several hours one night staring at the sky. I had never seen stars like that before. Special times at a special place. Ah, those were the days, weren’t they?